I love colour and am inspired by the world around me. However I also love experimenting with different values of a specific colour, to create monotone layout. Have you tried it? Here is my monotone layout for inspiration. 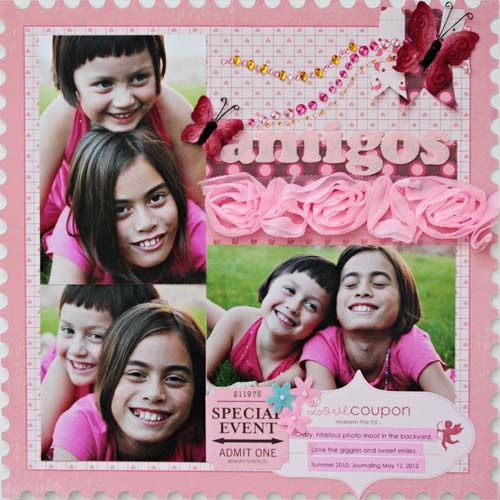 The above layout explores different shades of pink which in essence is a version of red. I love how the different values of pink add contrast and dimension to the layout. It is fortunate that the photos of my daughters also play off the monotone theme. What do you think? Do you like monotone layouts? I'd love to hear your comments. I love manufacturer collection packs! It is such a challenge to select my favorite papers so I usually just purchase everything :-) Now the other challenge is what to do with the scraps when I am finished with the main portions of the collection pack? 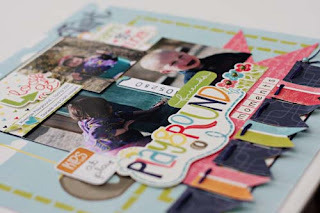 Well, the answer is to create another layout of course, challenging myself to use the scraps! Below is a layout inspired by a sketch from Valerie Salmon of Got Sketch and features the Echo Park collection pack. 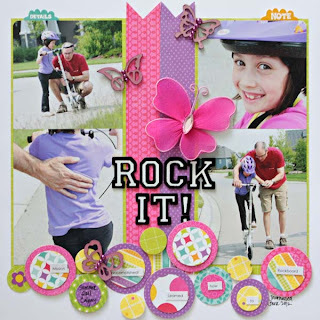 Are you inspired by this layout? Please let me know! 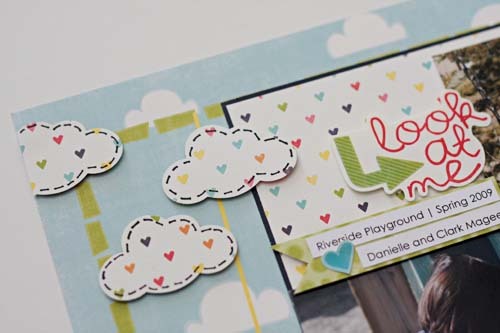 Many of you have remarked to me about how I use multiple bold patterns with vivid colours on a layout or card . Well one of the tricks I employ often is to mat the adjoining papers with a contrasting piece of cardstock. Doing so gives the eye a bit of a rest and consequently the adjoining pattern papers do not appear to be "touching." An example is the layout below using the yummy Basic Grey papers. Is this a technique that you use? It is summer in Calgary...well as summery as Calgary can be! 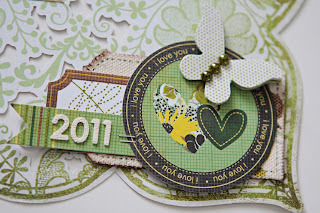 I think the Tigerlily papers from Kaisercraft are reflective of the season; don't you? In the collection, there are several yummy pattern papers, some softly patterned and others with bold designs and vivid colours. I personally love the packet of coordinating die cuts as there is a wide assortment included. 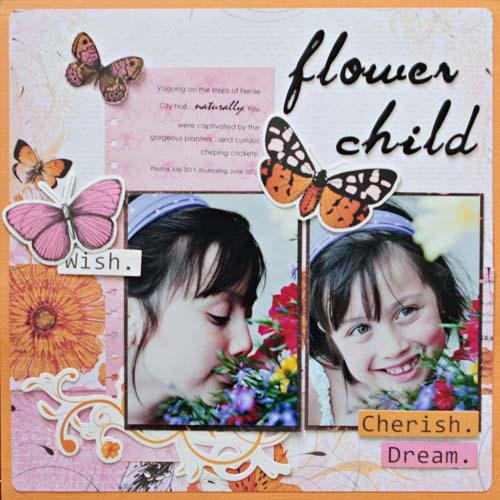 The colours are rather summery; there is a sweet pairing of orange and pink with a touch of chocolate brown...all in all, these papers are perfect for those spring/summer days, birthdays, weddings and that special little girl in your life. What do you think of Kaisercraft Tigerlily? Are you strapped for time? 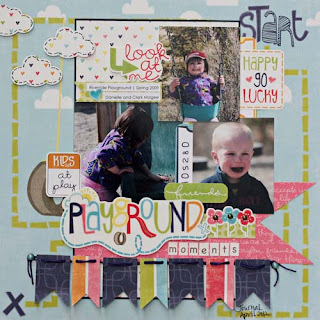 If so, I have an uber quick layout completed for your inspiration! Here is a close-up of the accent cluster! It is very easy to create! Choose 4-6 coordinating accents of varying sizes and shapes. Layer each accent on top of each other such that pieces of each accent is visible. Try to vary the amount that each accent appears visible to add interest. As well, try inking the edges of some or add some gems and pearls for extra visual interest. 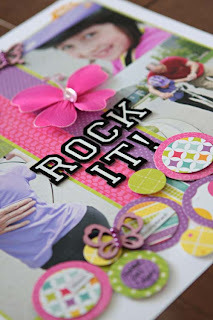 Attach using glue dots of my personal favorite, the Tim Holtz Mini Attacher. It's July - the sun is out and scrappy time is limited. Does that sound familiar? If you want to whip up a quick layout, here is some inspiration that is guaranteed to have you scrounging your offcuts bin! A couple of close-ups - one to show the uber cute Fiskars cloud punch and secondly the fun banner! 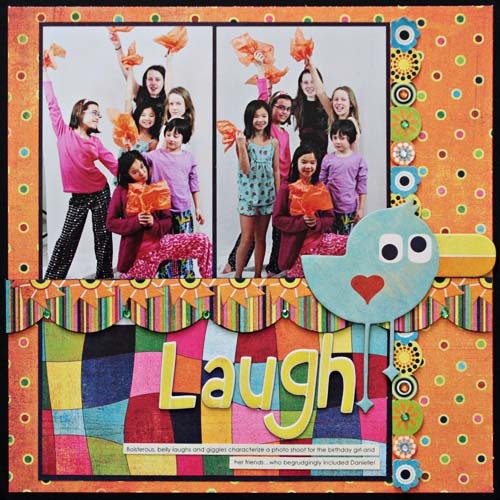 What have you done lately with your scraps?